KOLKATA: Steel Authority of India Limited (SAIL) has said stainless steel from its Salem Steel Plant in Tamil Nadu has been utilized in the Indian Space Research organization's historic Mars Orbiter Mission (MoM). The steel was used for fabricating the fuel and oxidizers tanks of the PSLV-XL which carried the Mangalyan to the red planet, 65 crore km from earth. The quality of the AISI 304 L grade l stainless steel manufactured at SAIL's Salem Steel Plant had to be manufactured to a high specification that could withstand the action of highly reactive fuel and oxidizers over a long period of time without developing any leakages. This is the second such instance where Salem steel was used to developed in a high profile space mission. SAILBSE -1.26 % had earlier provided stainless steel for the PSLV that launched the Chandrayan in 2008 and other PSLVs. Chairman, SAIL C S Verma: "We at SAIL feel extremely privileged to have contributed towards ISRO's success in putting Mangalyan in the Martian orbit in its maiden attempt. steel for projects of national importance." Fortune 500 level, a great feat in our networking to form a formidable Collaboration that expands our knowledge base to resolve corrosion, a global problem, in India. 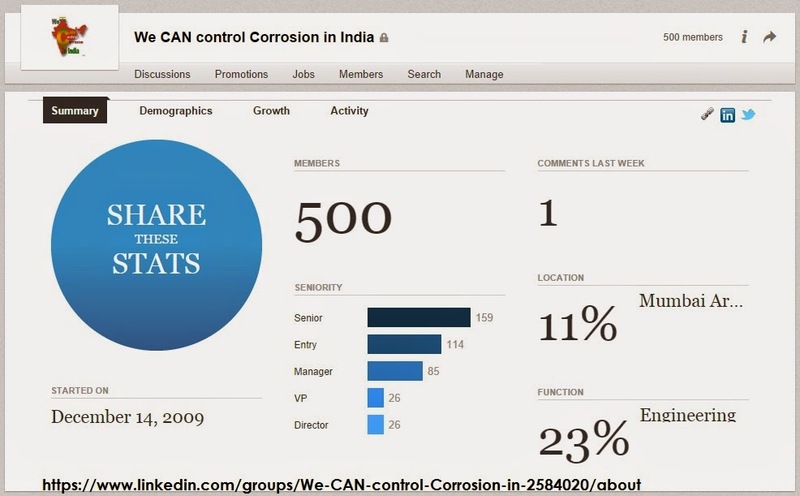 Our sincere thanks to all the members of We CAN Control Corrosion in India Network. We seek your constructive criticism to explore smart changes. Knowledge acquisition is cited as one of the main drivers for migration of talent from one country to another. Our Indian Diaspora takes active part in that process for one way technology development in the land of settlement. At the same time we do not put our diligent efforts in transferring knowledge from the overseas to our motherland. It is not the financial part alone for supporting industrial growth in India. We should develop our commitment to establish Knowledge Trust in various fields though collaboration. India - Corrosion management appears to be an iceberg for shipping industry in India. Our country sees tremendous growth in shipping industry. New building of ships is an encouraging sign to cater demands from marine oriented businesses. On the other hand there is a greater shipping demand to deal with refurbishment of aged carriers. We have significant percentage of Indian ships that have crossed 20 years of operation. This fleet requires frequent and extensive repair and maintenance. Corrosion of ship construction materials, the serious concern, often neglected by the industry is paving the way for greater impact in the life cycle cost. Marine fouling is another alarming area that fuels the parameters responsible for corrosion damage. These failures pose greater challenges to the ship owners not only in the materials part, but also leading to high demand for energy consumption and sizeable investment for environmental management. Corrosion should be viewed as an acquisition risk that calls for implementing proper corrosion prevention in the initial stage itself. It is argued that the Indian shipping industry in the present stage has not been so proactive in embracing the use of environment friendly technologies and the implementation of a full fledged life cycle approach would not be an easy task. Corrosion management appears to be an iceberg for shipping industry in India. When these issues are neglected by the asset owners, we will end up in loosing the significant material resources and heavily impacting our marine environment. The direction and pace at which the government was moving to transform India’s shipping industry would increase buoyancy and investment opportunities, experts said, although the initiatives were yet to make a noticeable contribution to the country’s gross domestic product. “To stimulate growth in any industry, it is important to put a policy in place, and we can see the government making efforts in this direction. Cutting unnecessary procedures is one of the important steps the government has taken,” a senior executive with Mercator told Business Standard. In July, the shipping ministry came up with a lifetime licensing model for Indian ships whereby shipping companies no longer need to renew vessel licences every year. L&T Hydrocarbon Engineering Limited (LTHE), a fully-owned subsidiary of Larsen & Toubro Limited, has secured new orders in the offshore and onshore segments worth Rs 1,920 crore from domestic oil and gas majors. “An offshore contract valued at Rs 1,340 crore from the Oil & Natural Gas Corporation (ONGC), won against international competitive bidding, includes engineering, procurement, construction and installation of five wellhead platforms at the Mumbai High North field of ONGC. The project, part of ONGC’s strategy to re-develop Phase-III of Mumbai High North field to enhance production from existing reservoirs, is scheduled to be completed by March, 2016,” said L&T in a press release. In the onshore segment LTHE has secured a contract valued at approximately Rs 580 crore from a leading company engaged in hydrocarbon downstream processing. LTHE will carry out engineering, procurement and construction of a dual service cryogenic storage tank facility, suitable for liquid ethane and liquefied natural gas and engineering work for the balance of the facilities to be installed at the client’s manufacturing complex. It is the collective responsibility of all asset owners involved in the entire petroleum value chain to assure that the corrosion risks from one side are not transferred to the other party by implementing the adequate mitigation and monitoring means. They need to change their approach from reactive to predictive one . Upsets in stream composition and operating conditions are the precursors for accumulation of risks to an unacceptable level. Corrosion management policies of our oil and gas companies have to be reviewed through an independent audit system involving domain experts. They need to develop a proper corrosion management plan for their assets and should follow predictive approach. We do not find the proper human resources for corrosion monitoring and control in their setup. Internal talent system of these companies should be properly equipped with corrosion management knowledge base to resolve the integrity challenges. Our non-revenue water is increasing day by day. We see numerous incidents of pipeline leakages reported in our country. Corrosion induced pipeline leakage is one of the major concerns completely ignored by water management authorities. There is no focus on these issues covered in the integrated monitoring plan and water policy administered by the central system. There is a misconception that nothing can be done about corrosion of old pipelines and the assets in entire distribution network. Numerous incidents of high levels of iron that contaminated public water distribution systems are reported in many parts of India. This is not produced from the water bodies. Now is the time to create awareness for corrosion in water infrastructure and encourage the design houses to employ proper life cycle analysis and choose water composition specific material and corrosion control system. NEW DELHI: Government has decided to launch a national scheme to conserve water on September 25 — the birth anniversary of late philosopher and political thinker Deen Dayal Upadhyaya. The idea is to conserve the scarce resource through a multi-pronged approach, involving state governments, general public and NGOs. The annual per capita availability of water is decreasing due to increasing population, indiscriminate use and growing pollution. The new scheme may focus on ground water recharge, use of recycled water and promoting better water use practices in a big way in all sectors under a structured nationwide programme. Announcing the decision to launch the scheme, the union water resources and river development minister Uma Bharti on Friday asked officials of her ministry to prepare the final blue-print of the 'National Water Conservation and Water Enrichment' scheme within 11 days so that it could be kicked off on time. Seeking free and frank opinion of the officers on various issues, the minister also asked the officials to extend their suggestions "without any fear and hesitation". The annual loss due to corrosion has been estimated at about 4 per cent of the country’s Gross Domestic Product (GDP), Vijayamohanan K. Pillai, Director of CSIR-Central Electrochemical Research Institute (CECRI), said and exuded confidence that the 17th National Congress on Corrosion Control, which got off here on Thursday, would evolve strategies to mitigate the problem. Speaking at the inauguration of the three-day congress organised by National Corrosion Council of India (NCCI), in collaboration with CSIR-CECRI, Indian Oil Corporation and Vellore Institute of Technology (VIT), he said scientists, engineers, technologists and industrialists would evolve strategies to mitigate different types of corrosion. Later talking to reporters, Mr. Pillai said though there was no proper study available to show the exact loss due to different types of corrosion, it had been estimated at 2 to 4 per cent of the GDP.